Sussie's Cards: My New Blog. Hi my name is Sussie welcome to my Blog! I coloured her using my Copic pens. Flowers are.. Spellbinders, TTL. Michaelmas Daisy. Stamping up Melon Mambo card. I hope you like my first post, please pop back I will try to post three times a week. Such a sweet card you have made. Hope to see many more. Love your card Sussie and Welcome to blog land. 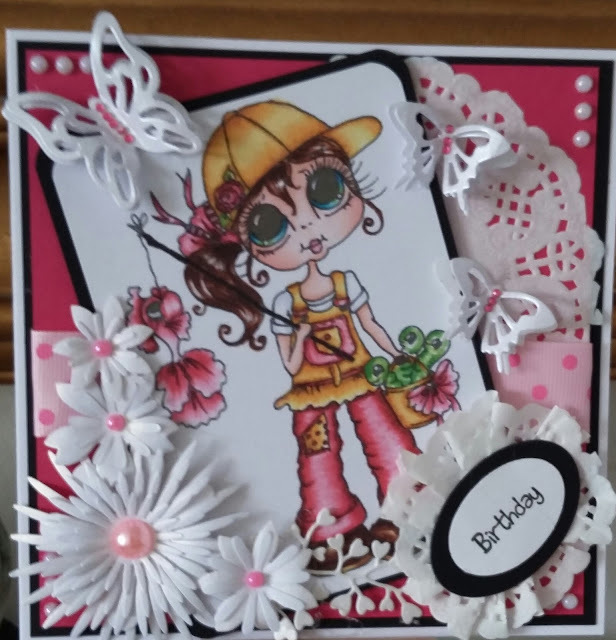 Lovely card Su, Thanks for sharing with us at My Besties UK Challenge. This is just so pretty and beautifully coloured. Thanks for sharing your talent with us. Hope to see you play with us again. Hi, Im Sussie, welcome to my Blog. I have been Crafting for many years. My favourite Crafting at the moment is card making and colouring with Copic pens. I have recently joined a craft club where they have talked me into making this Blog so that I can share my Makes.